Roping Garage Cable– First sign of fatigue. Caused By Stretching the Cable by The Torsion Drum and Weight OF The Garage Door. 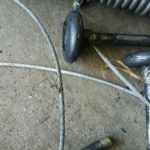 Looping Garage Door Cable – Second Sign Of Cable Fatigue. Caused By Excessive “Roping”. Basically Loose Loops Open Up On The Cable. This Looping Separates the Individual Cable Fibers and Increases The Risk Of Fraying. 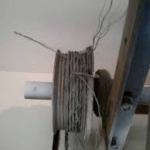 Fraying Garage Door Cable – Third Sign Of Cable Fatigue. Roping leads to Looping leads to Fraying. Visible Breaks in The Individual Fibers That Make Up A Garage Door Cable. From Here Garage Door Cable Replacement Is Strongly Recommended Even When It May Be The Only Problem Present. 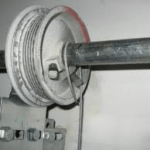 Kinks in Garage Door Cable – This Is Usually Caused When The Garage Door Cable Has Not Spooled On the Drum Correctly or A Garage door Off Track Condition. If The Cable Is Kinked then We Recommend Garage Door Cable Replacement To Prevent Fraying Or Potentially Future Spooling Problems. Fraying That Comes From Drum– The Drum Can Start to Lose its Cable Spooling Grooves. When These Flatten Out The Cable Will Rub on Itself and Cut The Fibers. Drums Can Form Burrs that Cut The Cable, and Drums Can Be Worn Down By the Cable Forming Sharp Edges that Can Cut the Cable Fibers. Cut Cable – DON’T. Do Not EVER Cut The Torsion Cable. How do you know if you have a broken cable? 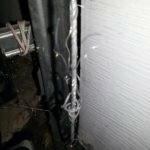 Typically you’ll see a wire/cable hanging near the garage door or you may also notice that the garage door springs look good and are not broken, but the door doesn’t work. 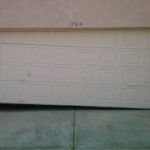 If you believe that the cable is broken and the door doesn’t open call a garage door pro – 303.565.6409. The cable replacement is a straightforward but labor intensive repair. The technician also look for the reason for the cable breaking, e.g. were other worn or broken parts causing the cable breaking. Cables are sold as a set (2). We do not sell under tensions parts retail springs, cables, drums, torsion tubes, bearings.